Interested in hosting WordPress on Google Cloud Platform? 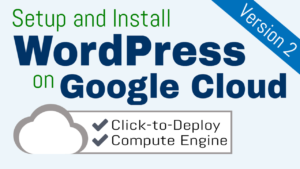 With the power of WordPress backed by Google’s cloud infrastructure, there’s no limit to what you can accomplish! In this series of five tutorials, you will learn how to host your WordPress website on Google Cloud platform. Tutorials 1-3 are required, and tutorials 4-5 are optional. The best part about this guide is that everything you’ll be configuring is free, with the exception of your domain name and Google Cloud hosting charges (get a free $300 credit). 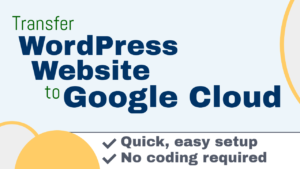 If all you’re looking to do is host a simple WordPress website, then Google Cloud is not the best option for you; managed hosting providers are cheaper and easier to use. There are even managed cloud hosting providers such as Bluehost Cloud (view tutorial). The main reason why you should host WordPress on Google Cloud is because you’re developing a website that you predict will grow in size and complexity over time, and you require a platform built with the infrastructure that your website will require as it grows. You’re interested in learning cloud computing. You have plans for your website to grow and become more complex over time. You’re able to find solutions to problems using StackOverflow and Google. You’re simply looking for the lowest-cost hosting provider. You’re not open to learning the command-line-interface. You don’t want to spend time learning Google Cloud . How much does WordPress on Google Cloud cost? The cost of hosting WordPress websites on Google Cloud (compute engine) varies widely, and depends on many factors. However, in most situations the cost is between $5-$25 per month for individual sites. Compute Engine is Google Cloud’s virtual machine (IaaS) product – and is Google Cloud’s primary product offering, comparable to AWS’s EC2 service. One benefit of using Google Cloud over other cloud providers is that the f1-micro machine is covered indefinitely under the Google Cloud free tier. The f1-micro machine is the smallest machine type available on Google Cloud, and it works great for running small to medium sized WordPress websites. Note that each Google Cloud account is limited to one free f1-micro instance per month. The cost to operate an f1-micro instance outside of the free tier is around USD $3.88 per month. Network bandwidth represents the cost of using Google’s network to serve your website’s content to visitors. The networking estimate in the image above is based on a website that receives around 30,000 unique visitors and 90,000 page views per month. As you can see, even on a medium traffic website, bandwidth costs are minimal and cost less than USD $1.00 per month. The great thing about Google Cloud (and other cloud providers), is that you pay for bandwidth using a pay-as-you-go model, in which you pay only for the networking (bandwidth) resource that your website uses. Persistent disks are the long-term storage used by your virtual machine to store your website’s files. In the image above, the cost for 20GB of SSD storage was calculated at USD $3.40. For comparison, that same amount of HDD space (20GB) would cost just USD $0.80. 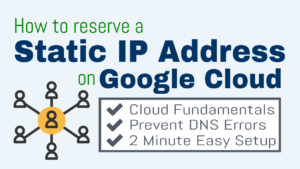 Cloud DNS is Google Cloud’s scalable DNS Service. The primary function of Cloud DNS is to ensure that when users visit your site, your URL resolves to a domain name instead of an IP address. As a developer on Google Cloud Platform, most of the WordPress websites I host on Google Cloud end up costing on average around $12-$15 per month. However, costs can vary considerably depending on how many upgrades and additional services you add to your website. 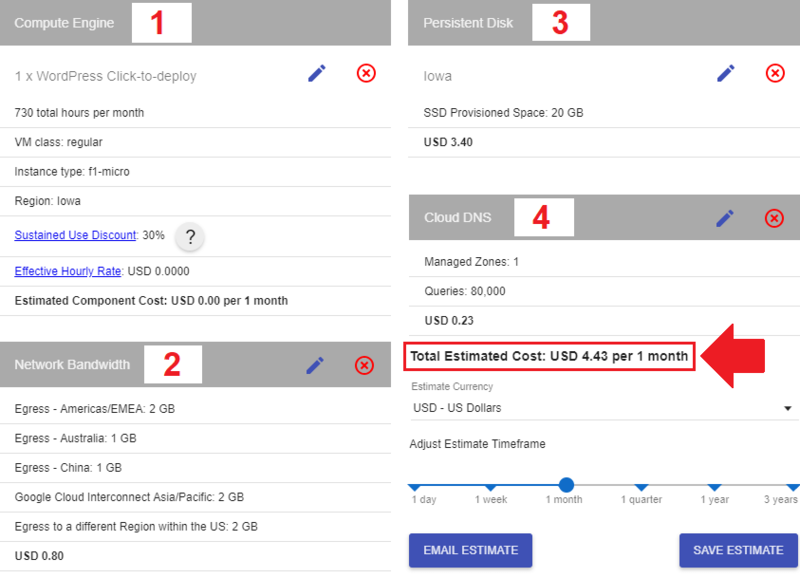 The base cost of hosting this WordPress website on Google Cloud costs under $5 per month, however, that cost doesn’t account for additional performance upgrades such as SSD storage and Cloud DNS. Be aware that the $7.06 static IP charge (from the image above) was incurred only because the static IP address was not assigned to a running instance. Static IP addresses that are attached to running instances are not billed at a higher rate. As you can see, without the addition of premium features to your WordPress installation, the cost of hosting WordPress on the most basic machine type would be under $5 per month. One Page Zen offers support and tutorials for the two most popular WordPress solutions available in the Marketplace catalog – Bitnami and Click-to-deploy. In this series of tutorials, you will be configuring your WordPress website using the Click-to-deploy (not Bitnami) version of WordPress on Google Cloud. 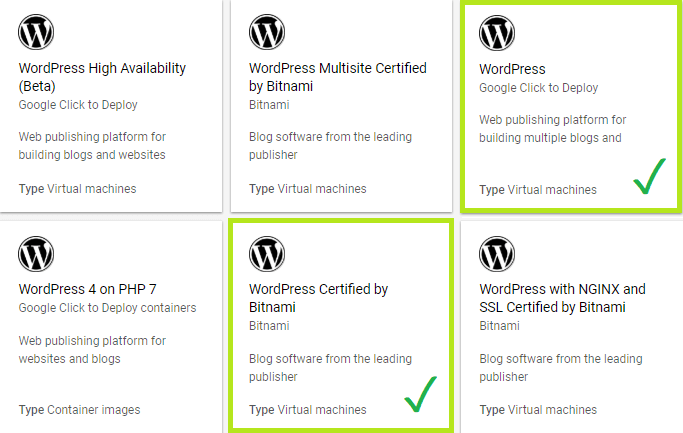 If you’d rather get started with the Bitnami WordPress stack, check out the tutorial here, or check out this comparison between Click-to-deploy and Bitnami. Although it looks intimidating, the command-line-interface allows you to quickly configure your website by running simple commands and scripts. The command-line-interface adds a new layer of complexity for users who are used to configuring their website through a graphical interface such as cPanel. If you’re not ready to use the command-line-interface, there are managed cloud hosting solutions available such as Bluehost Cloud – which offer many of the benefits of the cloud, without ever having to touch the command-line-interface. The default software ‘stack’ of a Click-to-deploy WordPress on Google Cloud installation. As you can see from the image above, your WordPress website will be configured on a virtual machine that is running LAMP stack (Linux, Apache, MySQL, and PHP) on a (Debian) operating system. If you get stuck on any of the tutorials, check the comments at the bottom of that tutorial’s page: it is likely that the problem you’re experiencing has been solved before. If you can’t find the solution to your problem in the tutorial’s comments, try posting your question in the comments section of the tutorial page, or on the WordPress on Google Cloud Hosting Support Group on Facebook. The WordPress Cloud Hosting Support Group on Facebook allows you to connect with a community of other developers who host their WordPress websites on Google Cloud. Now that you’ve learned about the pros/cons, costs, and considerations of hosting WordPress on Google Cloud, it’s time to get started deploying your website. Follow each of the following tutorials in order, and you’ll have your website up-and-running on Google Cloud in no time. Remember, if you run into any trouble along the way, check out the WordPress Cloud Hosting Support Group and/or leave your question in the comments section of the tutorial you’re struggling with! Good luck! In the first tutorial, you will be installing WordPress on Google Cloud using a pre-confiured LAMP stack on a Compute Engine Virtual Machine (VM). 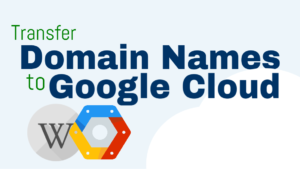 In this tutorial, you are going to configure a domain name to work with your WordPress on Google Cloud installation. Although NameCheap is used as the domain registrar in this tutorial, you can use whichever domain name registrar you prefer. In this tutorial you will learn how to assign a static IP address to the machine that is hosting your installation of WordPress on Google Cloud. For this tutorial, use method 1 (Reserve an existing IP address). If you have an existing WordPress website that you want to transfer to your new WordPress on Google Cloud installation, then this tutorial is for you. In this optional tutorial, you will use the All-in-One WP Migration plugin to quickly copy and transfer your WordPress website to Google Cloud Platform. IMPORTANT: If you have SSL configured on the website that you are importing to Google Cloud, then you should complete the SSL tutorial (below) before this tutorial. Do you want your website to load with a secure padlock icon? If so, this tutorial is for you. 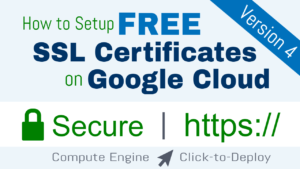 In this optional tutorial you will learn how to set up free, auto-renewing LetsEncrypt SSL certificates for your WordPress on Google Cloud installation. Now that you’re hosting WordPress on Google Cloud Platform, be sure to check out these other great WordPress on Google Cloud tutorials. If you have general questions or comments about this tutorial, please feel free to leave them below. If you get stuck on a specific tutorial, please post your questions and comments on that tutorial’s page. If you benefited from this tutorial, and would like to support my work, please like my Facebook page and subscribe to my YouTube channel. Hello Sir, I followed your tutorial. The first time it worked but I did something wrong while installing SSL so I deleted the whole project and started with a new one. After that, I have tried like 5 times but my website is not opening. The WordPress IP is opening but not my website. It sounds like there are several factors at play here. I would recommend starting again, and then if something goes wrong while installing SSL, don’t delete the project – just leave a comment at the bottom of the tutorial or on the WordPress Cloud Hosting Support page. How do you get WordPress to send out emails? Contact Forms, Newsletter Subscriptions, User Registration, Forgot Password etc don’t work. I would recommend configuring SMTP by following the instructions in this tutorial here. For a 20GB SSD instance on a n1-standard-2 machine, you would be looking at around $100-150 month. You may be able to get by on a n1-standard-1 machine for about half the price. Keep in mind that this is only a rough estimate, as 30,000 visitors/day is a significant amount of traffic, and your total cost depends on other variables such as the type of content you’re serving on your website (video/images/etc). You may want to look at a managed solution. 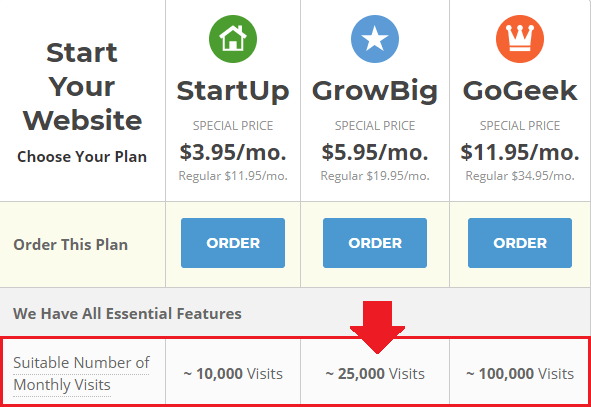 It will cost more, but that’s the route I would recommend, especially if you’re generating income from your 30,000 daily visitors. Good luck! I host my small business website on GoDaddy and I’m planning to buy G suite for me and my team. Will it be wise to move my domain as well as hosting to G suite and Google cloud? (by wise I mean cost effective and improved performance)? I don’t feel it to be great that email is on Google while WordPress website and domain on GoDaddy. Your recommendations? It doesn’t matter where you have the domain name. As long as you use Google’s nameservers, you shouldn’t run into any issues with configuration. I have deleted and re-deployed WordPress a number of times but do not seem to be able get my links to work. Any ideas? I have googled it and used a vid that shows how to update the htaccess file but it is still not working an my links. 404 page not found keeps showing???? I have used click to deploy and also set up FileZilla. All I have on that is folders:- wp-admin; wp-content and wp-includes. Did you follow my instructions from this comment? The requested URL /about-us/ was not found on this server. I am at a loss as what has happened and why I’m getting this 404 error. I did also try and change my sql password but now it seems not to be working either. I can’t access the database at all??? is there any way I can gain access again. All your help vids are for Bitnami and I used Click to Deploy. Regarding your database error, you will need to provide more information. I visited your homepage and noticed that phpmyadmin is indeed accessible, so is it your login credentials that are being rejected? What are you using for your username when you try to login to phpMyAdmin? We are facing the same issue – After migrating to GCP – the main page works fine. The links from the main page don’t show up and giving 404 error. Did the Permalink save. Modified the AllowOverride All. IP is static. What are we missing? When I reproduced the error, I was able to solve it by setting the AllowOverride directive to “All” in the Apache2.conf file. If it’s still not working for you, then make sure you saved the file properly after making the changes, and that you restarted Apache. If it still doesn’t work, I would try doing a Google search for the error and see what you can find on StackOverflow. I know this issue isn’t unique, as I’ve found numerous threads that addressed this issue. Hi, Your Tutorial Very helpful, If you have more time, please make an tuturial aboutHow to Install Ion Cube on Google Cloud(WordPress Click Deploy). I will look into doing an ionCube tutorial in the future. i am keep having the same issue. i upload a photo from media through wordpress dashboard. it shows fine and then it disappears after 2 days. as you said pagespeed is rewriting it and it doesnt find it afterwards so it returns a 404 error not found. This rule causes 404 for all requests which don’t exist on the filesystem, including mod_pagespeed rewritten resources and the mod_pagespeed admin console. This will allow rewritten resources, the admin console and static resources necessary for some filters. my question is where do i add the exception below where is that file?? The general process is outlined below. However, this is outside of the scope of support that I offer for this tutorial, and I recommend reaching out to Bitnami for exact configuration instructions. This is how I would go about doing it, but I haven’t tested this method so proceed at your own risk. As I mentioned before, I’d recommend reaching out to Bitnami to notify them of the issue. i dont undestand what is going wrong. i uploaded 3 photos to change for my home page, they show fine for 1-2 days and then they disappear or mozilla shows them and chrome doesnt. as you can see file name has an x in front and some other title after jpg. the same applies for the 4-5 photos. not sure what to do here. i also get this warning but the above problem with the photos is more important as they change after 2-3 days for some reason!! Your image URLs are being rewritten by mod_pagespeed to optimize them for performance. If you don’t want this feature, you can disable mod_pagespeed by following the instructions here. That being said, there seems to be a problem with your WordPress configuration as your image URLs aren’t showing the .com TLDs – this is a separate issue and is not likely related to pagespeed. Regarding the certificate error – this indicates that the certificate was issued incorrectly. It was probably caused by a typo when you first issued the certificate. You may need to delete the certificates and reissue them. how can i delete the certificates? you mean the ssl that i created with your video right? before i disable mod_pagespeed do i need it?? why it affects only the ones i upload now? i dont have .com blog, it is .gr . should i do something with it? should i change the ip in php wp options and make it www. my website .gr? i encounter a serious problem with the cloud. i have a slider on my website with 3-4 pictures . i changed them and uploaded through the admin page of wordpress in media. but when i open the browser the next day the slider cant read the pictures. they are just blank as if the cloud cant read the url of the pictures correctly. i am not sire what to do here. have you encounter such thing? This sounds like a front-end issue and isn’t something I offer support for. I’d recommend reaching out to one of the WordPress groups on Facebook and seeing if someone from the community can help you! I recommend WordPress Experts and WordPress Cloud Hosting Support. hi joe i have followed every video of your and it is the first time everything works like charm. you are great at what you do. 1.i have a question , i have set up my website on a 0,6 gram engine. will an 3.75gb ram engine improve my loading speed time?? 2. i have also entered a static ip address. does it really cost 7 $ per month?? does it worth it over share ips?? i am asking as i dont want to go too high with monthly costs. Thanks for the feedback – I’m glad to hear that everything is working correctly! The static IP address will cost around $7 dollars per month if it isn’t attached to a running instance, in which case it is billed at a higher rate of $0.010 per hour. Therefor, assuming 730 hours in a month, the cost can be calculated as follows: 730 x 0.010 = $7.30. Now remember – if your instance is running AND has a static IP address attached to it, you won’t be billed at the higher rate and there will be no extra charge for having your IP set as static. I thought that going to higher ram cpu’s would help the page but it is good to know there will be no difference in simple wordpress sites. 2. if i may clarify about the static ip , i changed it as you showed it this video. i have chosen the micro project. how can i know if it attached to my instance and not charged? i am concerned as my package now is close to 6-7 dollars while if i am charged with static ip it will go to 14 dollars per month ! Navigate to VPC Network > External IP addresses to view whether or not your static IP is connected to an instance. Yes it is connected to my website. i guess this means no charge. 1.One last question (for now 🙂 ), will google cloud cdn help me with my page load speed. does it worth it? have you seen monthly costs on average? do you have any video on that? 2. we are all facing the info @ website .gr email problem. is there a way to set up an info business mail? i am using smpt now for the contact forms of the blog. 1. Yes – Google Cloud CDN will help with your page load times, but it is expensive and requires the use of a load balancer, which would not be appropriate for your use case. A more appropriate option for you would be Cloudflare CDN, which I go over how to configure in this tutorial. 2. You want to know about configuring email accounts for your domain? I don’t have a tutorial on this right now, but hope to soon. 3. To edit RAM, stop your instance and click on the ‘Edit’ button in order to change the machine type (RAM) settings. To change SSD size, click on ‘Disks’ in the ‘Compute Engine’ left-sidebar column, then click on the persistent disk that’s attached to your VM, then click the ‘Edit’ button at the top of the page to edit the disk’s size. I followed above tutorial step-by-step up to Step 3: Assign a Static IP Address but on Step 2: Configure a Domain Name, I bump into an issue after 5: Edit WordPress URL. After implementing it, I can’t access my website anymore. Initially I thought this is normal since it says domain name changes could take 48 hours to take effect but it’s more than 48 hours already and I still can’t access my website using the URL. I can still access the website using the IP address but it’s styling was inactive since the site’s layout is pretty messed up. I’m new to both setting up WordPress and Google Cloud Hosting. 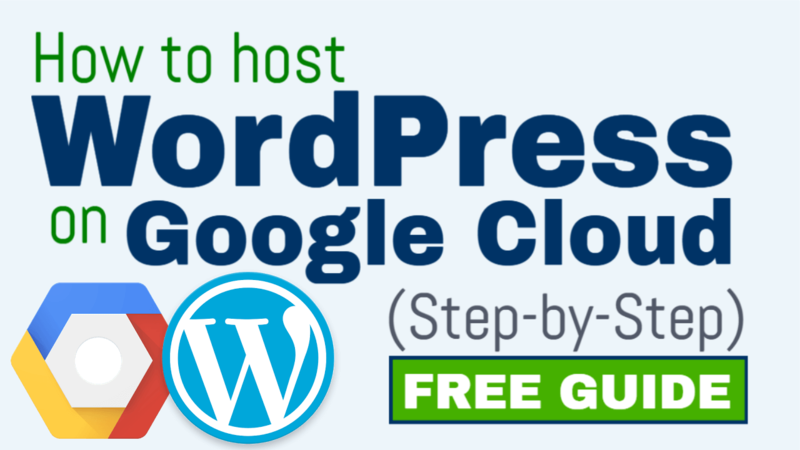 I wanted to use the free trial of Google Cloud Hosting to learn setting up a WordPress site. Hopefully you can help me on this. I am having this same problem, except a little worse. I was following every step of the tutorial very closely. Nameservers, DNS etc. is all set up correctly, have checked it over and over again. I pasted the IP/wp-admin in to browser, came up fine, edited the two fields to my url just as in the tutorial, and the SECOND I clicked “save changes” the page switched to an error screen saying it could not load. Any further attempts to go to url/wp-admin OR IP/wp-admin result in same failure to connect error message, however if I simply try and view the site by going to the url.com, I see the default WordPress theme and dummy content, but I am unable to do ANYTHING else. Did you ever get a resolution to this? hi, i followed you tut to install the wp on cloud. I found it was max out the cpu so stopped the instance to upgrade the machine and now I’ve turned it back on and it will not connect to the site. I’m not sure where to start troubleshot. Any advice you can offer would be greatly appreciated. Is your Apache server running? Is your Apache config correct? Let me know if you’d like a summary on how to check for the things mentioned in the above list. Hey Joe, thank you for you reply, yes if you could direct me to where to I can check those things would be awesome! If your VM is started, it will have a green ‘check mark’ icon next to it. Cordial thanks for the informative post. If I use Google Cloud do I need to use a CDN like cloudflare separately for better speed? Yes – I would recommend using Cloudflare CDN. I’m going to be publishing a tutorial on the process in the next couple of weeks. Basically, when using Cloudflare make sure to use the SSL (Strict) mode, and ensure that SSL is configured on your origin server (aka the server that’s running on your VM) prior to enabling this setting. This will provide the highest level of encryption/security for your website. For instructions on how to configure SSL for your WordPress website on Google Cloud, check out the tutorials for Click-to-deploy or Bitnami, depending on which version you’re using. Is there a version on GCP cloud launcher for WordPress + cPanel? Why wouldn’t google add a cPanel option to their “Click to deploy” version? They didn’t include a cPanel on purpose? There isn’t a cPanel configuration because most developers on the Cloud don’t use cPanel. cPanel is simply a graphical user interface to simplify the website management process for users who haven’t had much experience using the command line interface. Here’s a detailed tutorial with instructions on how to configure cPanel on Google Cloud. Can you provide a guide on installing ioncube Loader on Google Cloud? Some plugins on WordPress requires Ioncube Loader. Can we host a site perfectly using 300$ credit? N is it really worth shifting namecheap shared to this plan just for the sake of free for year? You should not move to Google Cloud just to save money – you will spend a huge amount of time learning how to use the platform itself. If all you’re looking to do is find the cheapest host possible, try a managed hosting provider such as BlueHost. 1. How do you know the verdict n of cURL libraries that is installed? 2. How do you enable or install ioncube loader? 3. How do you configure the Php.ini? Thanks for the feedback Ehab! CDN tutorial is coming soon so stay tuned! At this point I don’t offer support for Multisite, but I would recommend using the Bitnami Multisite stack as they have an excellent documentation on the subject. I have installed WordPress following your article. What I want to know is how secure is my site now on Google cloud. Is there Firewall and other security enabled by default or do I need to setup or configure firewall or anything? The default firewall rules are configured as required by your application – WordPress – so I wouldn’t mess with them because they are already optimized. If you get started with advanced configurations such as load balancing/CDN, make sure to follow the walk-through from Google Cloud, as they document best practices regarding firewall settings. Thanks mate – the tutorial helped a lot. Could you guide on how to host multiple WordPress websites on a single VM please? I will be releasing a Multisite tutorial soon, so stay tuned! This will be great! Bitnami or regular? Any idea when it will be out around? Your tutorials are great man. I will do a tutorial for both of them, Click-to-Deploy and Bitnami. You can expect one of them sometime next week! How to host multiple websites on Google Cloud compute engine? Please take the poll on the Facebook page to vote on whether the tutorials should be made for Multisite Bitnami or Multisite Click-to-Deploy. You can learn more about the difference between the two here. i have a question, how to host multiple domain on google cloud compute engine? Can you please make a tutorial for that? i have googled for my question and it just made me confused. or How to host multiple websites with different domains on a single compute engine virtual machine? or How to point multiple domains to a single website on Google Cloud? Let me know and I will look into making a tutorial on the subject. so yeah, i’ve found the way, so my original question is how to host multiple domain (wordpress website) in a single compute engine, so i just used the server pilot to install the wordpress and make the new Zone in the Cloud DNS at the google cloud console, and then i setup the DNS at the registrar. I am glad you were able to find a solution! Anyways, thanks for sharing the tips on CloudFlare. I’ve personally never tried their SSL service, but I am glad to hear that it has worked for you. hi guys i was wondering the same thing. can i host multiple domains in one single compute engine? This is another excellent article. I like that you have nicely packaged your tutorials into easily to follow steps. Also doing a cost and “is it right for me” comparison are great additions. BTW. I don’t see the links to the Bitnami tutorials you did for installing and setting up WordPress on the Google Cloud Platform anymore. In doing so, are you advising not to go in that direction? I haven’t started yet because I am too busy and don’t have the time to re-develop my website and setting it up on the CGP right not but I was thinking of going down the Bitnami path. If you don’t think Bitnami is a good option, I be curious to know you reasons. The reason I didn’t include the Bitnami tutorials in the ‘beginners guide’ is simply because I’ve found that the Bitnami version of WP on GCP is harder to configure than the Click-to-deploy version. Additionally, troubleshooting is easier on the Click-to-Deploy version because it uses a very standard LAMP stack configuration. This means that users are more easily able to use Linux/Apache support forums ‘out of the box’, without having to consider the unconventional directory structure of Bitnami’s WP configuration. The thing that I like about Bitnami, however, is their thorough documentation and support forums. I also like how they use an almost ‘standardized’ configuration across all of their stacks, which makes it easy to jump between stacks and/or integrate new ‘solutions’ from their extensive library. Thanks again for taking the time to post a comment. And when you do get started with WP on GCP, feel free to reach out to me with any questions/concerns/issues you run into during setup. Please share your questions and comments below!